I think I just stumbled upon a new fall tradition! I had apples, ginger snaps, & carmel to use up. 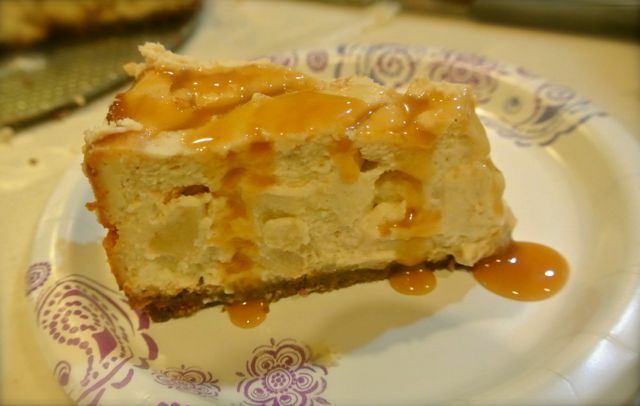 I took components of 3 different cheesecake recipes and created a new one. Combine & press into the bottom of a 9″ springform pan. Bake at 350 for 10 minutes. While the crust bakes, mix the filling. Combine cream cheese, sugar, & flour until well blended. Add eggs, one at a time, mixing well after each addition. I scrape down the sides of the mixing bowl after adding the second egg. Blend in vanilla & yogurt or sour cream. Fold in apples & cinnamon. Pour over crust & spread evenly. Drizzle with carmel sauce. I did not measure this. I would say 1/4-1/3 cup. Use a knife to swirl. Place springform on a cookie sheet that has been lined with foil. Bake at 350 for 1 hour, 10 minutes. Remove from oven & cool completely. Chill for several hours before serving. Serve with additional carmel syrup, if desired.